NS has daily contacts with its passengers, both in person and through social media. In addition, we maintain close relations with a wide variety of stakeholders. Thanks to the dialogue with our stakeholders, we are able to make the most of opportunities and mitigate or accept risks at an early stage. It also lets us bring valuable knowledge and ideas from our stakeholders into the organisation. This lets us create a better train product for the passenger. NS is a service-providing company that has a social role at the very heart of society. There is a great deal of interest in our organisation from the public and elsewhere – passengers, media, politicians and other stakeholders. The ongoing dialogue with our surroundings and our stakeholders is crucial for NS. We see our stakeholders as the people or groups who are affected by our actions and who have an effect on our organisation and services. NS is continuously monitoring who the interested parties are, thereby identifying and selecting our stakeholders. There can also be stakeholders who are on the scene temporarily for specific subjects – their input can be relevant and we therefore take them seriously. In the case of some specific stakeholders, our relationship with them is defined by law (the ministries and supervisory authorities), by cooperation within the transport sector (carriers, ProRail), or by the public nature of the services we provide (the media and interest groups). We discuss who the current and new stakeholders are once every two years at the Council for Sustainable Business. The results are then presented to the Executive board. This consultation will take place once again in 2017. NS and the individual business units are talking all the time to our key stakeholders. These are ProRail, provinces, municipalities, franchise authorities, the shareholder, staff, the unions, other carriers, politicians, employee participation bodies, suppliers, non-governmental organisations, interest groups within society and passengers’ and consumers’ organisations. We involve them closely and (increasingly often) as early as possible when choices have to be made that affect passengers. We test ideas and listen to suggestions and criticism from the stakeholders so that we can improve our services and products. Creating and maintaining transparent relationships with key stakeholders lets us bring signals from the external surroundings into NS in good time and we can include them in our deliberations and decisions. The dialogues with our stakeholders take place at various levels in the organisation, with the Executive Board often being involved. During working visits to NS, we kept various stakeholders informed throughout last year about our activities and intentions and we also let them experience for themselves what goes on in our 24-hour transport company. Representatives of various political parties accompanied an IC direct driver for an afternoon, for example, to experience from the cab what technical terms such as ‘voltage changeovers’ and the ERTMS safety system mean in practice. Others visited the upgrade workshops or talked to young train technicians going through their vocational training in the NS TechniekFabriek. After one visit, the State Secretary Ms Dijksma was so charmed by the Flirt that she concluded she ‘understood why it was called that’ (although the name of the new Sprinter train type in fact officially stands for Flinker Leichter Innovativer Regionaltriebzug). NS holds frequent discussions with ProRail and the Ministry of Infrastructure and the Environment about items such as cooperative projects, services and performance. In the national public transport users' forum LOCOV, NS regularly has discussions with broadly represented passengers’ and consumers’ organisations. This legally-defined forum consists of formal meetings and handles requests for advice on various issues that are relevant for consumers and passengers. There are also numerous informal themed sessions and working visits to provide information and consult the members. Recommendations made by LOCOV regularly result in us changing a decision. We bring participating organisations on board such as ROVER, Ieder(in), the KBO union of senior citizens' organisations and the ANWB for topics that have a longer-term impact. Examples include the purchase of new rolling stock, changes to the timetable and major service interruptions. The new NS strategy was also discussed in 2016. All the important stakeholders are kept informed at themed sessions and in face-to-face discussions. As part of the pilot with renewable diesel, NS also published a White Paper (in cooperation with GoodFuels). NS also took part in various round table discussions this year with members of the Lower House of the Dutch parliament. These covered items such as personal safety on public transport and the European train safety system ERTMS. Civil servants and other administrators in municipalities, provinces and urban regions regularly ask NS (via its regional boards) questions about the ‘railway world’. Who takes the decision that a lift should be put in place at the station? How can a municipality get a new station built? What role doe NS have in the High-frequency Rail Transport Programme? We respond to these questions by talking to our partners in an effort to satisfy their need for information. That is why NS started First Class Railway Knowledge in 2012, a masterclass in which we share our knowledge twice a year and give civil servants and administrators a better understanding of various aspects of the railway system (which can be rather technical). Subjects such as ‘How do you arrive at a timetable for the next one to five or ten years?’, ‘How do you tackle the refurbishment of a station or station area?’ and ‘How do you deal with major engineering work?’ were discussed over the past few years in the masterclasses, usually with 50 to 60 participants. In 2016, there was a masterclass on innovation and trends. The ‘OV Toekomstbeeld’ report on the picture of the future for public transport, trends at stations and the M-Lab (the NS innovation lab) were also discussed. Informing stakeholders about dilemmas in good time is how NS tries to provide insights into policy considerations and find joint solutions. We provide our stakeholders with a steady stream of feedback about their ideas and recommendations and the effect that the dialogue has on NS policy, both in the regular discussions and in reports. We make many choices when drawing up a new timetable. It is unavoidable that while many passengers will benefit from any particular change, there will also be groups of passengers for whom the choice has an adverse effect. We enter into a dialogue with consumer organisations about these dilemmas. The 2017 timetable is a completely new design for the national timetable. NS has not been able to improve the timetable for all passengers: passengers around Dordrecht have to change trains, and the journey time between Almere and Schiphol has increased, as has the journey time between Vlissingen and Rotterdam. We want to compliment you on the process adopted so far. You involved us from an early stage and at specific points in the working out the design for the 2017 timetable. This lets us present our views early on, and also lets us give you advice based on sufficient information. We appreciate this very much. This year, passengers were able to talk to the developers of the 2017 timetable in the NS online forum to get answers to their questions and an explanation of the choices made. Some passengers were more understanding after they heard from the developers that some problems simply did not have a better solution. NS also made amendments to the timetable in response to suggestions from passengers. For example, the early train service to Schiphol was changed based on comments by passengers, even though this meant a dilemma for the scheduling of trains. The introduction of the work packages for 2017 led to dissatisfaction among drivers and chief guards, in particular because of a lack of variation and more turnarounds per shift, resulting in a greater feeling of being ‘hurried’ than in the past. Although the packages are in line with all the agreements, NS is not happy with them either. The introduction of new trains and the loss of some routes has made it more difficult to create work packages on a par with previous years, and there was not enough time to make the packages as varied as possible. NS is working hard on making improvements. Society and the government determine our objectives. The Ministry of Infrastructure and the Environment monitors the quality of our public transport product and the Ministry of Finance (as the shareholder) also monitors the return on investment. Both of these objectives are important: it is a question of ‘both’, not ‘either-or’. In carrying out our core activities, we still face a potential conflict between our social and commercial goals. For example, how should we respond to new transport initiatives that are good for mobility in the Netherlands but result in reduced turnover for the main rail network, such as long-distance bus services? In the past we adopted a defensive stance, but now we prioritise the interests of passengers and collaborate with other parties. We are constantly talking to our shareholder and the franchise authority about how we can give top priority to passengers without endangering our own financial position. Utrecht Vaartsche Rijn is the seventh and final station to be delivered in the Randstadspoor programme, setting up a high-grade rail network able to transport passengers in the Utrecht region with more frequent services. Randstadspoor has more than 80 kilometres of new track, seven new stations, three reversing headshunts and two dive-unders. The station was due to come into use at the end of 2016. The provincial authority and municipality of Utrecht wanted to be able to use the station four months earlier, when the new school year started. That put huge pressure on the schedule and the work that had to be done. Despite this, we managed to open the station at the earlier date thanks to effective collaboration. For instance, the municipality of Utrecht worked hard on having the layout for the station surroundings ready on time. ProRail and NS went to great lengths to make sure the station was ready in good time. The tracks between Utrecht Centraal and Vaartsche Rijn were connected up at the end of May and work then continued on the track and the final stages of the station. Now there are eight trains an hour during peak periods. In addition to our regular contacts with stakeholders about day-to-day matters, we also want to have a dialogue about opportunities, threats and trends in the medium term. That is why NS organises coordinated dialogues with a wide range of stakeholders about our social role and on specific themes where our organisation has an impact. These are themes that concern NS’s stakeholders or NS itself. This lets us facilitate a dialogue not only between stakeholders and NS, but also between the stakeholders themselves. This form of stakeholder engagement regularly leads to a better understanding of one another’s interests and valuable constructive criticism and ideas for NS. In 2016, dialogues took place with passenger organisations and consumer organisations about the accessibility of rolling stock and stations. NS also talked to NGOs and scientific institutes this year about our ambition of making replacement bus transport more sustainable. Although NS will no longer be running trains on diesel routes as of 2018, diesel is still being used by external bus companies in the replacement bus passenger transport. After a trial run in practice with renewable diesel — hydrotreated vegetable oil (HVO) — we spoke to NGOs and experts in the field about the options for achieving our ambition and what was not possible. What sustainability criteria can you set without asking market players for something that is impossible? How can NS create enough of a critical mass for the market and what dilemmas will there be if it commissions the wide-scale roll-out of emission-free bus transport? The dialogue resulted in useful ideas and information that NS will be able to use in the future when making demands of the market. Visually impaired passengers really want to be able to travel by train independently. 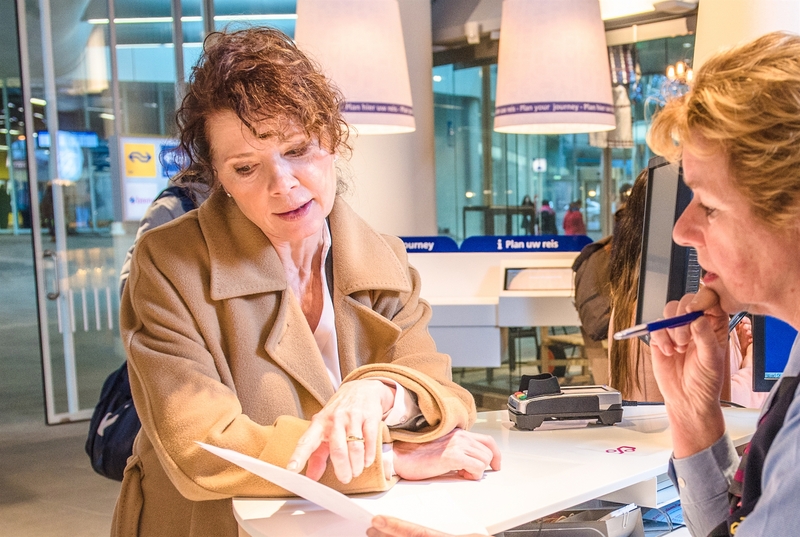 In 2016, NS worked closely with the Dutch Eye Association (Oogvereniging) to make travelling easier for people who are blind, partially sighted or deaf and blind. For example, it is now possible to book a journey with OV-chip Plus digitally as well as by phone. In the design of new rolling stock, considerable attention has been paid to clear visibility through the use of colour and contrasts. In addition, it is possible to feel what functions buttons have. Accessible journey information for visually impaired passengers is an important issue for us that we are keen to work on with NS, both now and in the future. Together with NS, we are delivering a top-class vocational training programme every day in TechniekFabriek. This is a unique apprenticeship in which mechatronics mechanics learn a profession in a venture that is a close collaboration between NedTrain and the ROC Twente regional training centre. It serves as an example nationwide of attractive vocational education, set up and executed in a respectful partnership. More trains, more stations, more passengers. The Stadsregiorail programme is enabling Nijmegen to benefit in 2017 from trains every fifteen minutes to the five new stations that have been built in the past few years in the region as well as a faster IJssel line. That gives tourists, shoppers, schoolchildren and commuters more options. Along with the fast connections, the station areas have also been revamped, making them safer and more accessible. That is really boosting other developments in these areas. And it is an important incentive in persuading people to take the train more often rather than the car. So Stadsregiorail is genuinely benefiting our region thanks to the successful cooperation between the municipalities and NS.